Let me tell you a story you already know. Some 500 years ago the Europeans re-discovered the North American continent and colonized it. English, French, Spanish, German, Dutch and even Russian people populated colonies, all mixed within the “Thousand Nations” of native peoples here in what is today the United States. But of course, we only became a nation in 1776, just a scant 235 years ago. What we tend to forget is that America was not a superpower with overnight success. Depending on which historian you ask and how we define the term “superpower”, America evolved into this status somewhere between the end of the First World War in 1919 or at the end of the Second World War in 1945. So America has been a superpower for 92 years or 66 years depending on who’s counting. What this means is that for less than a century the US Armed Forces have been projected to the farthest corners of the earth, fighting in every conceivable terrain and weather condition. Incredibly, for the past 46 years of that short reign as a superpower, the American warfighter has reached for the AR15 to conduct the dangerous and deadly business of waging battle. In other words, it is not the beloved Springfield M1903 that holds this record, though it served for an impressive 32 years as a main battle rifle. It is not the venerable M1 Garand that holds this record, having served 20 years as the main battle rifle. Nor is it the magnificently accurate M14 that served a mere 8 years as our main battle rifle. Though to be certain, each of these designs is brilliant in their own rite. No. The longest serving main battle rifle is the “mouse gun”, the “Mattel toy”, the weapon that everyone loves to hate, the AR15. It has now surpassed even the service record of the Brown Bess musket in the US military. How did it come to this? The improbable success of the AR15 in its many variant generations – M16, A1, A2, A3, A4 rifles and the equally numerous carbine generations from the XM177E to the current M4A1 serving across the globe – likely stems from the AR15’s incredibly flexible platform. It might be argued that the AR15 consistently wins “second best”. It cannot outshoot long range .30 caliber battle rifles. It lacks the penetration and energy-to-target ratio of that weapon class. It is not as agile as the bullpup series of rifles and carbines. Nor is it a particularly cheap weapon to manufacture. And it certainly doesn’t have the reputation of reliability such as the Kalashnikov! Don’t kid yourself, perception is a critical factor in gaining the confidence of warriors. What it does do successfully is rank as a suitable alternative for each of these considerations – accuracy, lethality, agility, reliability, and cost. And that status earns the AR15 a reputation as a remarkably adaptable weapon to various battle environments, from the beaches to the jungle, from the cities to the mountains, from the arctic to the desert plains. This consideration, coupled with the modularity of the AR15 platform and its ability to switch the same weapon from a rifle, to light machinegun, to sub-machinegun, and back to a carbine gives the US Armed Forces exactly what it needs. Flexibility. The AR15 has not been a beloved weapon. Exactly the opposite! It was despised in the months and years after it was introduced. America was embroiled in the jungle warfare of Vietnam. The hard-hitting and accurate M14 quickly became of victim of its own success – unnecessarily accurate in the confined close quarter fight of the jungle. The AR15 was introduced to the US Army in 1965 as the M16 rifle, and was erroneously touted as a “self cleaning” wonderment of modern weapon technology. Nothing could be further from the truth. The unbelievably tight working spaces, necessary for a piston-free direct impingent gas system, required disciplined maintenance by the troops. Add to that frustration the fact that the US Army Ordinance had allowed a more corrosive powder to be used in the early ammunition than was called for by the AR15 weapon specifications, and disaster soon followed. It seemed that the AR15 had failed. But dutifully, US Army Ordinance began insisting on the cleaner powder in the ammunition, and took the design back to the drawing board. Changes were made, most notably the protruding forward assist press lever and raised box rim around the magazine release button. These were small changes, but very significant. The M16A1 saw proliferated service among all four branches of the US military by 1967. It was a much better design, but it was still hated. It seemed the AR15 could not shake the stigma from its earlier failures. And to this very day, the Canadian Army speciously insists that the forward assist must be tapped each and every time a round is chambered in their AR15 variant, the C7. The fact that the AR15 was adopted by so many allied militaries is something of a miracle in and of itself. Our NATO allies viewed the 5.56mm round as a underpowered runt, undeserving of a main battle rifle. Yet admittedly several Asian militaries were quick to embrace the weapon due to its manageable size, light weight and very low felt recoil. By the 1970s high speed cameras and the use of gelatin molds were used for a more scientific approach to in-flight ballistics and terminal ballistics. A remarkable thing was discovered. It turns out that the 5.56mm round had not only a much flatter in-flight trajectory than most other battle rifle cartridges of the day (already known), but the terminal ballistics of the 5.56mm round were terribly lethal and downright nasty! What this meant was that the AR15 could be aimed at the target with little regard for bullet drop all the way out to 300 meters. And when the bullet struck even the soft tissue of its intended target, the bullet would very quickly yaw (turn sideways) and fragment from its full-metal jacket. Even the lead core would often fly apart. And it maintained this deadly yaw and fragmentation effect out to just over 200 meters. Suddenly, the AR15 didn’t look quite so puny. After almost two decades of service, it became clear to NATO armies that America wasn’t going to dismiss the AR15 anytime soon. France chambered its new FAMAS bullpup in the American 5.56mm cartridge and the rest of the NATO partners took note. Soon the Belgians began work on the small bullet to see if they could somehow beef it up for their FNH Minimi (US M249) light machinegun. They did just that. And the US Marines fell in love with the new round. 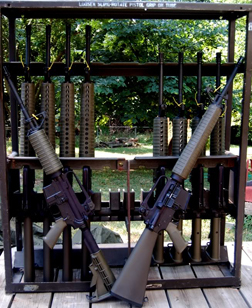 In 1982 the newest generation of AR15, the M16A2, was introduced to the US military. This rifle sported a heavier barrel with significantly tighter rifling to stabilize the newly developed Belgian SS109 round (US M855) at 62 grain weight, up from the US Army’s M193 bullet at 55 grains. The M16A2 also included a better rear sight with a mechanical bullet drop compensator for quick adjustment for firing ranges beyond 300 meters. Anecdotally, US infantrymen took the new M16A2 to known distance (KD) ranges and quite literally were giggling like school girls! The advancements to the AR15 were enough to make a good rifle into an excellent rifle. It was now possible to aim directly at the target at 500 meters with little regard for bullet drop and hit time after time, even in rapid fire conditions. In a period of less than ten years, National Rifle Association (NRA) 600-yard competitions saw the AR15 platform increase from just 10 percent of rifles used at these events, to 95 percent use. With just a bit of tweaking, this rifle could regularly manage sub-minute of angle (MOA) shot groupings. By the early 1990s, the AR15 had finally come into its own. It has since served another 20 years as the main battle rifle of US forces. We’ve seen the 3rd and 4th generations of the AR15, making it all the more modular and specialized to just about every warrior mission and task. 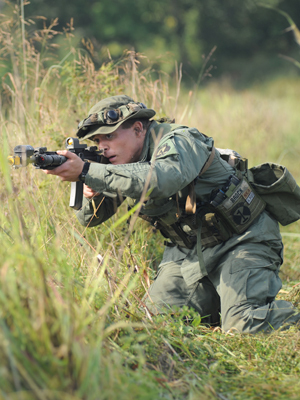 In the mid-1990s the stunted carbine, a favorite among US Special Operational Forces, was accepted as the issued weapon. With all of the recent upgrades, this carbine was dubbed the M4. Virtually every allied military uses a variation of the AR15 weapon, and/or has developed their own rifle and carbine in the same 5.56mm cartridge – France, South Korea, Germany, England, Canada, Australia, Belgium, Italy, Swiss, Austria, the list goes on and even includes Russia. There are now numerous contenders to the AR15, many claiming to be superior for one reason or another. But those claims have yet to pan out. Even inside the US there have been new weapon platforms introduced that were supposedly going to outperform the AR15. The promising XM8 project, a joint US and German effort looked to improve on the two perceived weaknesses of the AR15, the direct impingent gas system and the underpowered bullet. Soon after the XM8’s rejection by the Pentagon, Bushmaster released another attempt to overcome these two weaknesses with the short-piston Adaptive Combat Rifle (ACR). While both the XM8 and ACR look impressive on paper and in initial field performances, the US military is understandably reluctant to give up a known success, the AR15. Is the AR15 perfect? Of course not! Such a claim would be ridiculous. And certainly something in the near future will replace the AR15 and our love-hate relationship with this improbable but successful weapon system. Still, love it or hate it, the AR15 weapon platform has been the go-to solution for the US military and numerous allied militaries around the world for an incredible 46 years of service. Whatever replaces the AR15, it has big expectations to fill. It turns out it is not so easy to be “second best” at everything. Who knew?